Watermeal is a challenge to control and can easily double in an area in just two days! 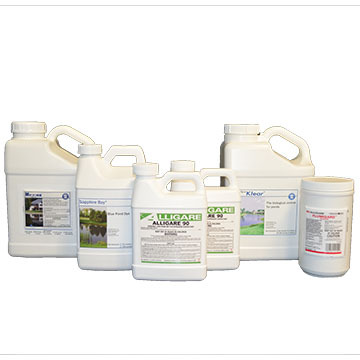 Take control with the 4 products that are listed out below for an effective way to approach watermeal control in ponds. Flumigard has quick dissolve granules that mix well into the water eliminating messy application. Flumigard can also be pre-mixed with water and applied using a chemical sprayer. Flumigard delivers fast and selective control in ponds of tough invasive and nuisance plants such as cabomba, watermeal, Eurasian watermilfoil, water lettuce, duckweed, giant salvinia and more. Plus, Flumigard dissipates quickly from the water column and does not accumulate in sediment. Items heavier than 30 pounds may incur additional shipping charges. Certain restrictions apply for shipping to AK,CA,CT,HI,ME,NJ,NY,VT and WA. We had struggled with keeping our pond clean and clear and tried several other products before using these. I must say they are able to keep our pond sparkling all year long.